Is the first and most spacious co-working space in Chisinau, offering dynamic and fixed open working space. For more than a year and a half in Chisinau has been launched „the place where the most successful projects in the field of information technologies are born”, and since then, here are continuously emerging some of the best IT ideas in the country. Generator Hub is the first and most spacious co-working space in Chisinau, offering dynamic and fixed open working space. Organised as a non-governmental association, the Generator Hub operates non-profit, aiming at developing the country's IT community through co-working, trainings, events and hackathons. The idea to launch such a project in Moldova belongs to the best professionals in IT. In particular, it is about Vitalie Bordeniuc - director of the Association DNT, Dona Scola - President of the Association DNT, Sergiu Nagailîc - founder of the "Association Drupal in Moldova", Victor Sitnic – director of "CTI Capital", Sergei Demcenko, Olga Batîr - project manager Generator Hub and Anton Perkin - founder of the "Association of IT specialists from Moldova". Youth from IT sector or anyone who needs a space for development, can find it at Generator Hub. For such reasons, subscriptions have been created in order to meet the requirements of any professional. The person who rents a space in hub, is called a co-worker, and at the moment, around 70 co-workers operate, out of which 80% are IT specialists. 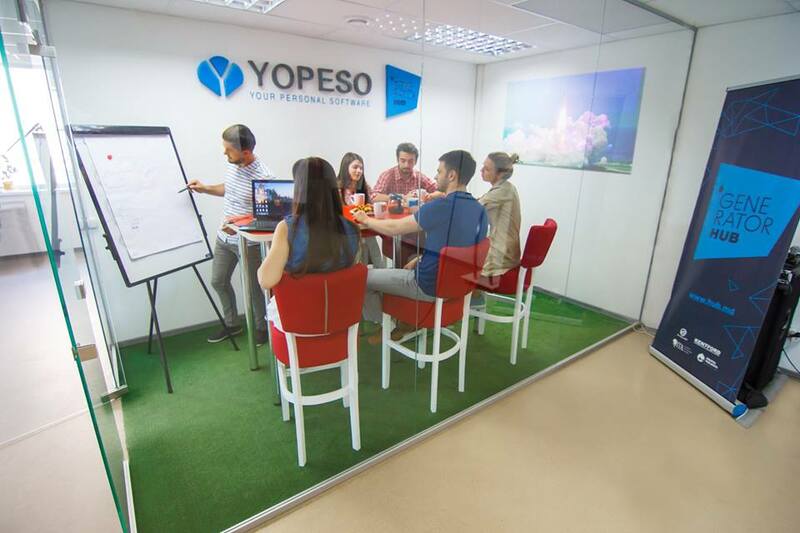 The 70 co-workers are working in teams of 2-6 people, either individually, but all are a family, what motivates them to continue their work in the family that created it. The accommodates both freelancers and international companies that have opened branches in Moldova. "We're like a family, and this is the advantage of a hub. We all know each other, we socialize, work and besides work, we have fun together by organizing team-building activities. This is what keeps me here, and probably others as well. Why do they come in co-working? Because they are not bothered by housekeeping, supply of consumables, paying for utilities, internet etc. We take care of those, so we create a favorable environment for development, "says Patricia Vieru, project manager of the Generator Hub. Grigore works as manager SMM (System Management Mode). He choose co-working especially because he can find here specialists who can help him to develop his ideas. "I like working in co-working because I always find someone whom to ask for advice," says Grigore. 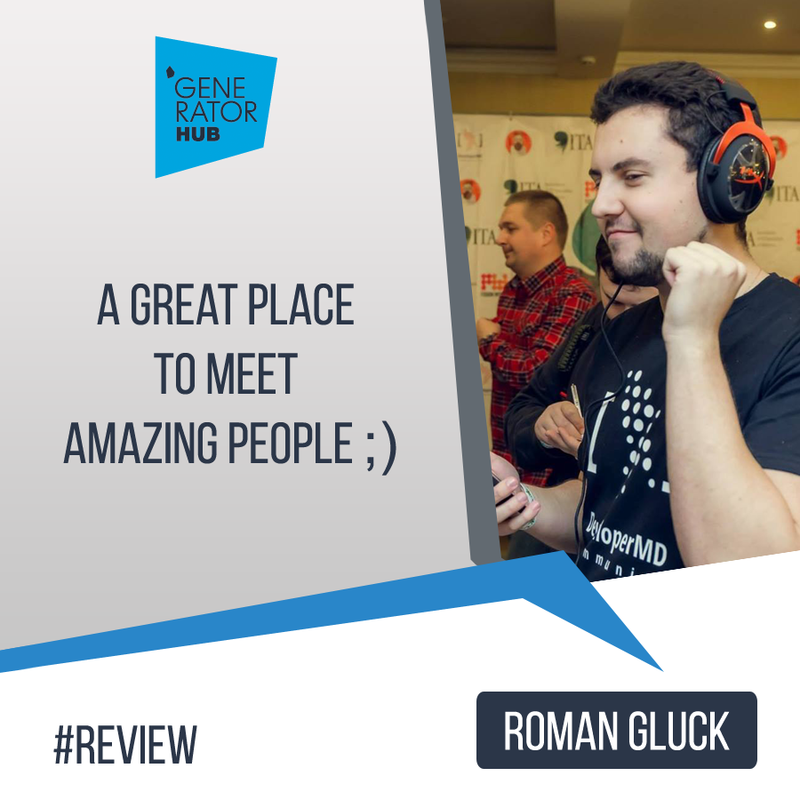 Roman Gluck, who is a volunteer at Generator Hub says that his motivation to be part of the family Hub is communication with interesting people". Generator Hub is a place where you can meet great people." Another advantage of this type of activity is that working in different fields and gathering specialists in different branches of IT, those within the hub can easily and quickly develop ideas and reap fruitful results. "Although they are IT professionals, they are good at different things. This is how collaborations emerge. We know how hard it is to find someone who is doing something specific, and here they all know each other, so they can always help each other. For instance, one had an idea to create an application, but he/she does not know how to implement it and needs tips for designing it. Being in the co-working space, he knows whom to ask, this is how useful and successful application projects develop”, says project manager. In addition to the provided space and friendships enabled by Generator Hub, co-workers have the opportunity to participate for free at the events organized by the association. Over the period of one year and a half, the Generator Hub hosted over 600 events. "We organize and host events on various topics. Co-workers participate at all of them, regardless of who is the organiser. Moreover, there are participants outside the co-working space, who are interested in our events. Due to our active community, there is no public event without participants.”, confirms Patricia Vieru. The entire activity of the association is directed by three people: Patricia Vieru, who serves as project manager, Nicole Damian – event manager and Roman Gluck, who works as a volunteer. Although there is a great amount of work, the key to well-organisation is, they say, planning and division of labor. "There is a lot of work, especially when organizing international events, but we manage. Sometimes we sleep here, sometimes we work on weekends. The founders get involved as well, come up with ideas and help implementing them, says Patricia. Besides the evident talent and perseverance, Generator Hub is the generator of creative ideas as well, where art and IT merge to create beautiful things. Through its activities, it stimulates the creative industry, thus contributing to promoting values and culture. Among the most profitable creative industries in our country is the software and the computer games field and design. 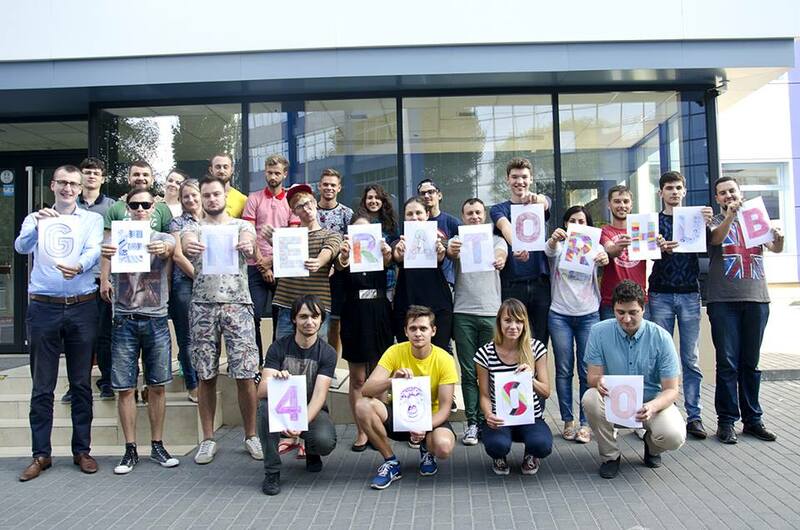 Generator Hub is where the project „Folks” was born - a brand of street clothes, with a traditional Romanian elements. Three youngsters, inspired by folk, who want to promote street style, combined with local nuances, through the clothes they create. Generator Hub invests in the gaming industry as well, through organizing and hosting events for developers -those who develop online games and gaming enthusiasts. "We work with gamers. We cooperate with those from Game Factory in organizing the International Conference of developers in Moldova and organizing different events in this segment, "says Nicoleta Damian, event manager Generator Hub. Through the International Conference of developers, organizers aim at linking the developers among them, so that they would be able to share their experiences. For example, during the Conference organized last November, they learned how to develop a game in two days and how to promote it worldwide. These creative industries have huge significance for a country like Moldova, therefore Generator Hub will continue implementing projects and invest in their development. In this autumn, they plan implementing a series of projects in the future. 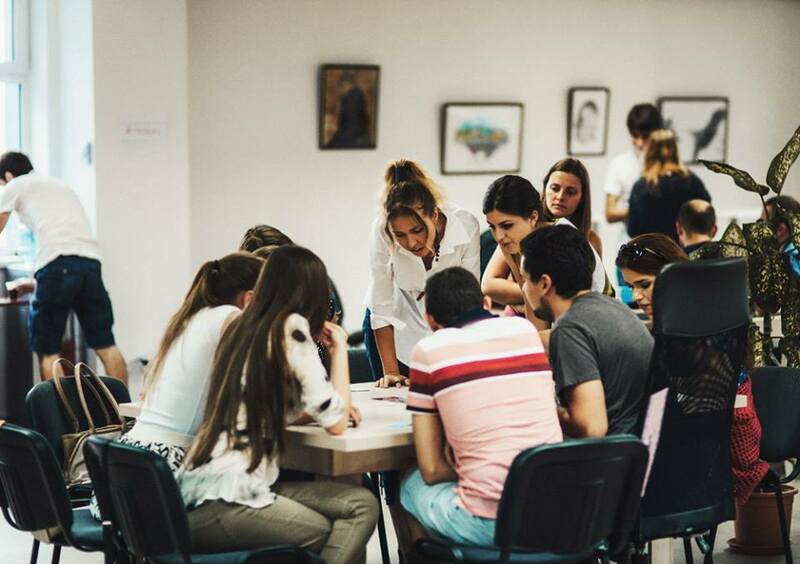 „Mentors for mentors” – the project aiming at training mentors in Moldova. Mentors from United States will come to Chisinau and will train local mentors, so that later they can be mentors for start-ups from Moldova. „ITMC for IT” – a course to improve the practical skills of IT students. 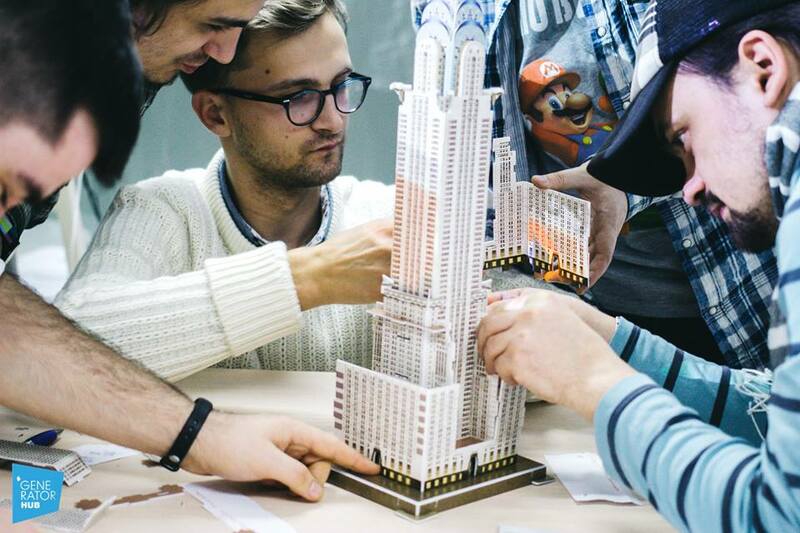 Courses will be taught in such a way that requirements of companies that are looking for new specialists are met. Finally, graduates of the course will have a month internship in the requested company, where they later have the possibility to be employed. Generator Hub will be the intermediary between students and the IT companies. „Kids IT” It aims to deliver simple computer courses for children. It will be launched in October. Two groups of children will be formed: those who can not read yet, and for those who already know the alphabet. In addition to these projects, Generator Hub aims to establish partnerships with international hubs for online exchanges, where their events are broadcast live in Moldova and vice versa. Besides projects, Generator Hub is planning to expand in a space of 500 square meters, so that in order to create small ofices, in addition to the co-working space. "Let's keep IT specialists home ..."
"Let's keep IT specialists home," this is the basic purpose of those working at Generator Hub. Moldova has no natural resources or tourist attractions, but it has human resources that should be valued and supported. Often, the best specialists from us are being "hunted" by international companies and they go abroad. 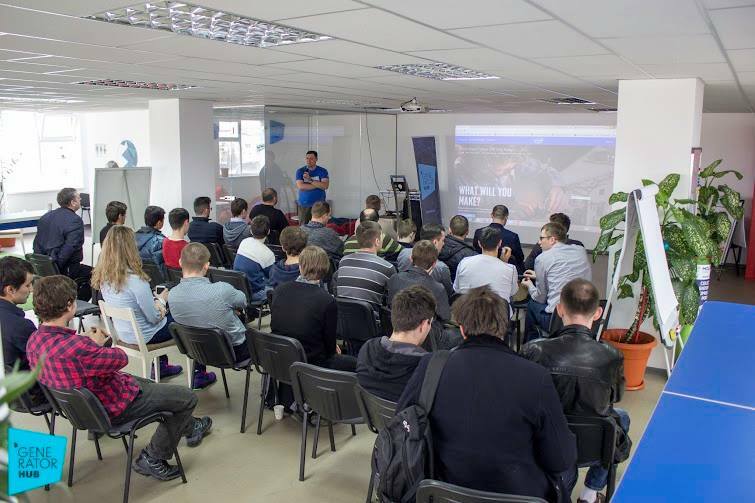 Thus, to support the IT community in Moldova, Generator Hub aims at evolving, offering them a space favourble for development, where specialists in information technologies improve their abilities, so the IT sector to grows in our country.